In Morelia, Michoacan, authorities discovered 21 bodies near the five main highway exits into the city. The men, all thought to be between 20 and 35 years old, were left alongside notes which identified them as petty criminals and warning others. Some of the bodies were reported to show signs of torture. Morelia is the hometown of President Calderon. In Hidalgo County, Texas, at least three suspected drug smugglers were wounded after a fire fight with US law enforcement officers along the Rio Grand. The officers were apparently trying to intercept a large drug shipment when they came under fire from the Mexican side of the border. In Ciudad Juarez,a peace march led by Mexican writer and poet Javier Sicilia arrived in the city with about 1,500 followers. The march left from Cuernavaca on June 5. In late March, Javier Sicilia's son was killed near Cuernavaca alongside several friends. Also in Ciudad Juarez, nine people were murdered in several incidents across the city, making it the most violent day in the city so far in June. In one incident, two men were killed after their vehicle was attacked by gunmen armed with assault rifles. In the small town of El Terrero, Chihuahua, five members of a family were gunned down by a group of gunmen. Witnesses later reported that the men came searching for another target, and that the family was killed when they said they didn't know where he was. Two of the dead were children aged 3 and 4. In the municipality of General Teran, Nuevo Leon, three mutilated and dismembered bodies were found at the main entrance to the town. The dead are presumed to be members of the Gulf Cartel, as two banners signed by the Zetas were left at the scene threatening Gulf Cartel leaders M3 (Samuel Flores-Borrego) and R1 (Juan Reyes Mejia Gonzalez). In January, two police officers in General Teran were kidnapped and killed in a similar fashion, which lead to the town's entire police force quitting. In the city of Chihuahua, a police commander was shot and killed after leaving a hospital, where he had been treated after being wounded in another attempt on his life earlier that day. In Monterrey, a man was hung from a bridge and set on fire. Hundreds of motorists and pedestrians were in the area to witness gunmen arriving at the bridge, douse the victim in flammable liquid and throw him over the side of the overpass. The same bridge was the scene of a similar crime the previous Wednesday, in which gunmen hung two men. In Tijuana, former Mayor Jorge Hank Rhon was cleared of federal weapons charges, but was immediately taken into state custody without charges as investigators seek to collect evidence for a murder trial. According to Baja California authorities, at least two weapons of the many that were recovered from his house have been used in homicides. In the United States, an unnamed State Department official confirmed that at least one American citizen was among the 193 bodies recovered from mass graves in the San Fernando, Tamaulipas area in April. Why doesen't the American people understand? This is a real war, and as many prople are being killed across our border as those in the Middle East. Stop the so called "War on drugs" it's not working! 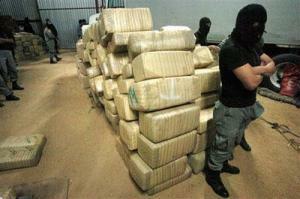 Mexico has been arrested the peoples and gangs which are spreading and distributing the drugs on the country. Government has started the war with these enemies on the superiorpapers.com website some super posts against this have to be militarizations.